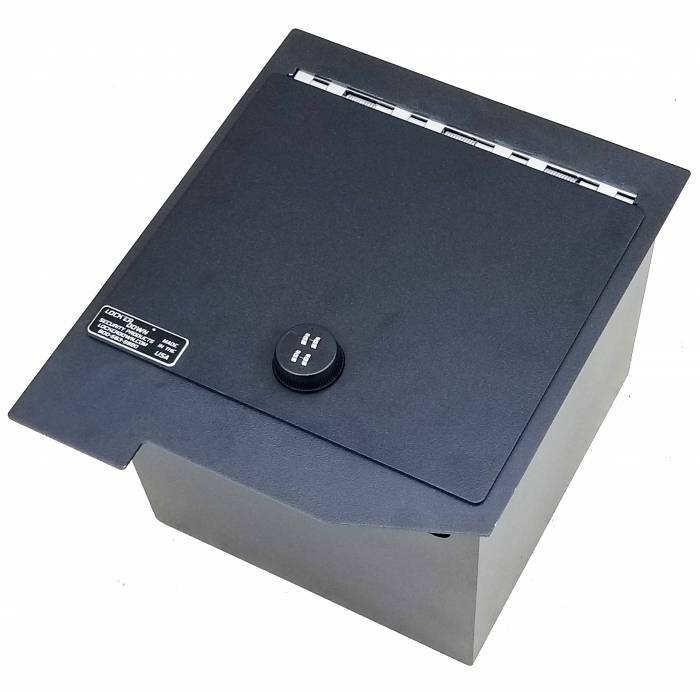 This is our new EXxtreme version of our safe designed to fit the 2007 to 2013 Toyota Tundra and 2008 to 2019 Sequoia using true 12 gauge domestic steel. The door is skeletonized and then a 10 gauge plate is welded to the lid to make it stronger and cover the gaps around the front and sides of the door. 12 Volt power port is accessible inside the safe. Made in Texas by Texans. This model is available with several lock options, please choose before adding to cart. NOTE: Some Sequoias may have electronic inside console preventing the unit from fitting. Easy 10 to 2o minute installation. The safe is awsome and true to fit also got the new digital lock and easy to use and set. I work in law enforcement and have investigated hundreds of vehicle burglaries. When it came time to protect my own vehicle, I chose this console safe. I'm honestly astounded at the quality. The fit and finish are impeccable and I now recommend these safes to all my co-workers and the victims I encounter. I can't imagine any suspect defeating these with any of the typical tools and even then it would require a considerable amount of time. In summary, my only regret is not ordering sooner!